The official Japanese information Twitter account for the Pokémon franchise revealed some amazing news on Thursday: the Pokémon: Let’s Go, Pikachu! and Pokémon: Let’s Go, Eevee! Nintendo Switch games sold an estimated combined total of 3 million copies worldwide in their first week! The post added that the games have achieved the highest first-week sales for the Switch so far, which is no easy feat given the presence of other amazing IPs like The Legend of Zelda and Mario, to name a few. In the land of the rising sun itself, the games were the highest selling game for the week, with 661,240 copies sold. The Pokémon : Let’s Go, Pikachu! and Pokémon : Let’s Go, Eevee! games shipped for the Switch on November 16. The games are set in the Kanto region of the first Pokémon games, and are specifically based on 1998’s Pokémon Yellow. 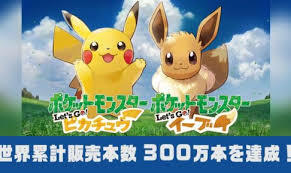 Notably, the game combines the classic elements and features the series is known for with new ones from the smartphone game Pok é mon GO, such as its capture mechanics and the Combat Points system for gauging a Pokémon’s strength.